Broadcast Engineering Consultants India Limited issued BECIL Recruitment 2018-2019 Notification. All the people who are Looking for the Central Government Jobs should hurry Up. The Final date to utilize this golden chance is 9th April 2018. So, already the officials of BECIL are accepting the applications from the eligible and interested contenders. Therefore, those candidates who are willing to apply for this BECIL Recruitment 2018-2019 Notification should know some basic and mandatory details. And for such people’s sake, here we are updating this article. So, as per the information in Notification, there are total 131 Patient Care Manager, Patient Care Coordinator Vacancies. Therefore, the officials of the BECIL are looking for the candidates who are eligible and can work in that positions. To make it more simplified, the officials even mentioned the requirements in the advertisement itself. Check the next sections of this post for more information. BECIL Recruitment 2018-2019 Notification is out for a while. And this is grabbing all the attention from the people who are searching for the Government Jobs for a while. And many of the people are unaware of this Notification. Therefore, to make this more available for all the Aspirants. Here in this post, we are going to list ou all the details clearly one by one. Therefore, those people who are interested in applying for BECIL Recruitment 2018-2019 can check. And proceed to apply, if they are eligible and have all the qualifications correctly. As per the information in the BECIL Recruitment 2018-2019 Notification, contenders should have finished Bachelors Degree in Life Sciences with full-time Post Graduate Qualification in Hospital Management/Full Time Bachelors Degree in Life Sciences or Bachelors Degree in any field along with one year experience in a hospital after the acquisition as the Educational Qualification. Please check the above table. And it contains all the basic information about the BECIL Recruitment 2018-2019 Notification. 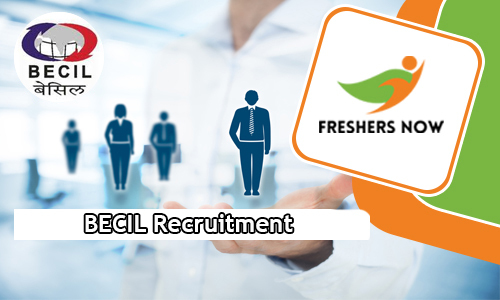 By looking at it, you will all get an overall idea about the requirements that are necessary to apply for the BECIL Recruitment 2018-2019. Check them all without missing anything. Because having all the qualifications correctly is quite mandatory. If not in such cases, the officials are going to reject the applications for the contenders. Therefore, consider this fact and proceed to check the remaining details. In the sections of this post, all the candidates can find the information about the Openings. After the educational Qualification, the people should also know about the correct age. As per the information in the notification, applicants should have the age between 35 years to 40 years. And there is even some age relaxation. Therefore, all the contenders are requested to check the BECIL Recruitment 2018-2019 Notification for the age relaxation information. Now, after the age relaxation, many people might be wondering about the application fee. After checking the BECIL Recruitment 2018-2019 Notification clearly, there is no mention of the application fee in the advertisement. Therefore, please try to recheck the advertisement or the official portal for the confirmation of the details. So, Now, after submitting the application form before the final date, the officials of the BECIL will conduct some Recruitment Rounds. And through these rounds, the officials of the organization are going to choose the best people. According to the BECIL Recruitment 2018-2019 Notification, the applicants have to clear the personal Interview. Apart from the interview, there are no other rounds, which the applicants have to clear. Therefore, all the contenders are requested to prepare for the interview well in advance. Now, as per the BECIL Recruitment 2018-2019 Notification, the contenders who will be placed in the Broadcast Engineering Consultants India Limited will get the fixed salary. As per the info in the Notification, people will get pay scale between Rs.17,916/- to Rs.30,000/- Per Month. Patient Care Manager (PCM): Bachelors Degree in Life Sciences with full-time Post Graduate Qualification in Hospital (or Healthcare) Management from a recognized university. At least one year experience in a hospital after an acquisition of the aforementioned qualifications. So, there is no application fee. But please check the BECIL Recruitment 2018-2019 Notification correctly. Apart from the Interview, there are no other rounds that the candidates have to face. Following is the salary that the people will get if they got the job. So, We hope that all the people are satisfied with the number of details given on this page about the BECIL Recruitment 2018-2019 Notification. And to get more such updates and fast notifications, always come back to our site regularly. Freshers now is a place where you all will get the correct and revised data.